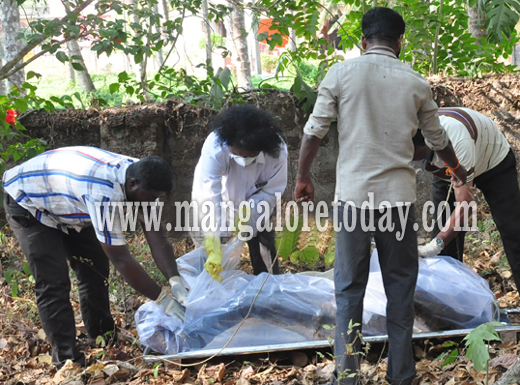 Udupi, Feb 17,2017 :The decomposed body of an unidentified man has been found in an unoccupied house near the city bus stand on February 17, Friday. The age of the deceased is estimated to be around 40. The suspicion is that he might have been murdered. A person named Prashanth Kamath is the owner of this house. Though he had rented out this house to some migrant labourers some time back, they had vacated the house a few months ago. The house had remained vacant since then. The presence of the decomposed body in the building came to the notice of the public who went inside after sensing foul started emanating in the area. It is suspected that the man had died three to four days ago. As playing cards were found inside the house and the rear door lock was broken, it is believed that some people might have been gambling and the man might have been killed owing to some dispute. Most of the times the times the police take such cases for granted that is why the crimes are increasing ? Recently there was an article about two of them being murdered atop of building no clue of it till date, There are so many of such , who are responsible for there is it this? Is the house located in th remote place , else did the local resident notice the strangers entering the house? Don’t you have conscious which pricks you when you do something wrong ?